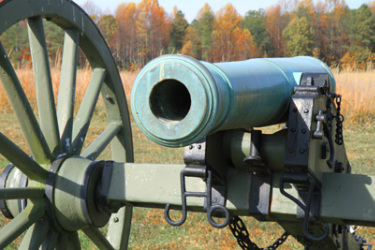 6 pound cannon fired by Confederates at Malvern Hill. Uz Williams Cox was born October 23, 1826. He was a farmer. He lived in a small community in Sampson County, North Carolina. At the age of 30, he married Serena Margaret Sneed. The couple continued to live in Sampson County, North Carolina where they had many relatives. On July 5, 1861, he mustered into the 10th Volunteers which would later become Company H, 20th Regiment of North Carolina. On August 20, 1861, he was appointed Captain of his regiment. On July 1, 1862, he was wounded in the thigh in the Battle of Malvern Hill which was the final day of the 7 Days Battles fought outside Richmond, Virginia. Uz was hit in the testicles which produced an irreparable hernia. Uz resigned and his resignation was accepted by President Davis on December 1, 1862. Uz returned to North Carolina but was eventually found on 1880 and subsequent censuses in Darlington County, South Carolina. He died May 23, 1895 and is buried in Cartersville Cemetery in Florence, South Carolina. Uz has three descendants in our Chapter.